UU A Way Of Life: Friday, 11/27/09, is buy nothing day. 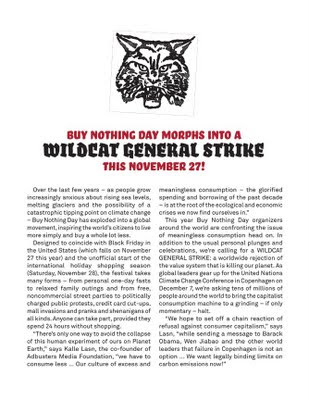 Friday, 11/27/09, is buy nothing day. It has been a tradition in many faith traditions for adherents to fast. Fasting sharpens the mind and the spirit and demonstates a commitment to values more important than physical gratification. Could you fast from shopping for a day to demonstrate an appreciation for our planet and a respect for the interdependent web of all existence which we humans are destroying by our zealous overconsumption and misuse for profit? Take a day off. Spend some time with family, friends, and neighbors. Join me in taking a break from shopping. Consider it a Unitarian Universalist Holy Day during which we pay homage to that which we consider more important than more stuff. I have boycotted this shopping nightmare for years. It is a gross homage to the consumer frenzy. I'd rather comb over a used bookstore, thrift store, or yard sale at a leisurely pace anyday.